Britain’s garden heritage is known and admired throughout the world. The gardens of Cumbria and the Lake District National Park are no exception; they show an infinite variety of design amid plants introduced from all over the planet. The locations are diverse, attracting garden historians (some gardens date from the 17th Century), distinguished landscape architects, discerning plants men and women. The countryside of Cumbria is a natural garden - rich flower filled meadows bounded by hedgerows, dry stone walls, ancient woodlands, upland slopes full of gorse and heather. Wander amid a profusion of unusual plants, visit discriminating nurseries in delightful places when you visit the gardens of Cumbria. Be inspired! 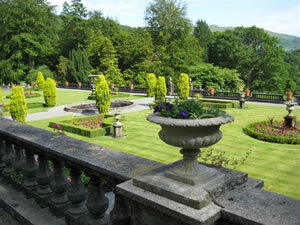 The Eden Valley - Lost in the depths of the rolling countryside are picturesque villages and breathtaking gardens. Discover the rural communities of Ellonby, sleepy Millburn, Newbiggin, Long Marton, Armathwaite and Great Strickland. Explore historic houses and castles. We heard raves from Merilyn Presten today. Her only regret was that the trip was over. She was very pleased with the entire program. She praised Val - and commended her hard work and patience and expert commentary. I thank you both for carrying this trip through to success. Best regards –Alicia Carew, Carew Travel Consultants, Connecticut, USA regarding the San Francisco Flower Club Tour of London and the Cotswold.